On October 29, 1923, the newly recognized Turkish parliament proclaimed the establishment of the Republic of Turkey, formally marking the end of the Ottoman Empire. 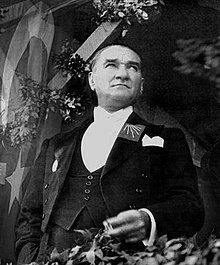 On the same day, Mustafa Kemal, who led the Turkish National War of Liberation and was later named Atatürk (father of Turks), was unanimously elected as the first president of the Republic. Turkey had effectively been a republic from April 23, 1920 when the Grand National Assembly was inaugurated in Ankara. When the Turkish parliament held its first session in 1920, virtually every corner of the crumbling Ottoman Empire was under the occupation of Allied powers. Exasperated by the Ottoman government's inability to fight the occupation, the nationwide resistance movement gained momentum. With the Allied occupation of Istanbul and the dissolution of the Ottoman Parliament, Mustafa Kemal's justification for opening the resistance movement's new legislative body was created. With the opening of the Assembly, Ankara became the center of the Turkish national struggle for liberation. The National War of Liberation culminated in the emancipation of Anatolia from foreign occupation, the international recognition of modern Turkey's borders by the Treaty of Lausanne, and finally, the founding of the Republic of Turkey on October 29, 1923. October 29, or Republic Day, is an official Turkish holiday celebrated each year across Turkey and by peoples of Turkish heritage worldwide. Following the founding of the Republic of Turkey, Mustafa Kemal Atatürk embarked on a wide-ranging set of reforms in the political, economic and cultural aspects of Turkish society. These reforms have left a lasting legacy of which the peoples of Turkish heritage are proud: the conversion of the newly founded Republic into today's modern, democratic and secular Turkish state.